Venkatasubban, K.S., Rothchild, R., NMR Studies of Drugs: Antipyrine and Analogs. II. 1H and 13C Chemical Shift Dispersion as Conformation Indicator for the N-Phenyl Ring. Spectroscopy Letters: An International Journal for Rapid Communication, 1997, 30(8):1685-1697. 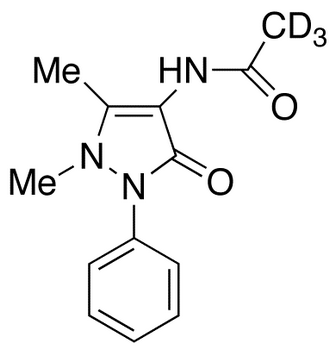 Applications: Labeled metabolite of Metamizol. Metabolism of Metamizol occurs in the early stages of the incubation of a hen's egg.